"What? 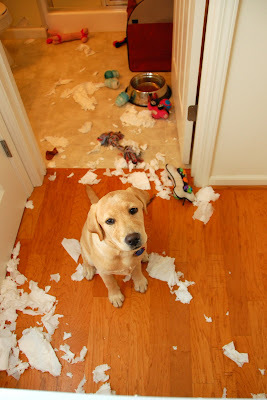 Watches aren't chew toys?" "Items in the recycling basket are chew toys though, right?" As Lucca gets older (she'll be 5 months old on Sunday) she develops more and more..."personality". By personality I mean - stubbornness, feistiness, craziness, clinginess and destructiveness. But at the bottom of it all she is loving. She's taking her wet-food bowl into her crate. That's where all her prized possessions go. 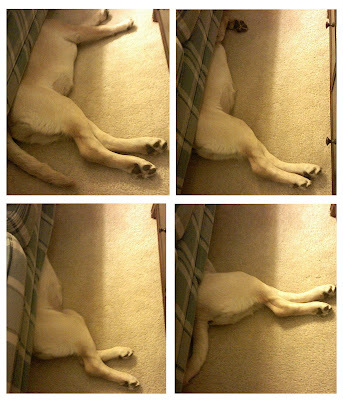 Lucca was sleeping next to my parents' couch... and slowly disappeared completely underneath it! She looks like some alien dog here - with weird arms! So the funny and destructive things she does - while a little frustrating right now - do make us chuckle. I know we'll look back on these times one day and wish she was still a puppy. Do you ever bring Kaweah to the Bay Area? Lucca loves to play with any and all dogs - but she certainly has a special affinity for labs!! I can imagine how much work she is, but she's also so much joy!